As I believe most people in the Civilized World know, it snowed in NYC over the weekend. We got a couple of feet of snow in the city courtesy of Jonas and they called it a blizzard. Of course, in what I assume was unfortunate for the Lamestream Media, we handled the storm and its aftermath in normal New York fashion. Recently, in response to the pathetic outrage of the “Black Community” over the lack of Black Oscar nominees, Stacy Dash once again spoke truth to what passes for power among the Blacks within America’s borders. And, of course, once again the drums are beating and both the Blacks and their White Liberal enablers are attacking and vilifying Ms. Dash for voicing a truth that is contrary to the orthodoxy of Black Identity, steeped as it in special protections and victimhood. We have to make up our minds. Either we want to have segregation or integration, and if we don’t want segregation, then we have to get rid of channels like BET and the BET Awards and the Image Awards, where you’re only awarded if you’re black. If it were the other way around, we’d be up in arms. It’s a double standard. There shouldn’t be a black history month. We’re Americans, period. Of course, it was the stark simplicity of Ms. Dash’s statement that, more than anything else, fired up the ever-angry and ever-aggrieved “Black Community.” It presented them with a clear and unassailable by logic choice: segregation or assimilation; being Black or being American. This is not something that they can tolerate because their culture’s very identity is based upon not making that choice but, instead, demanding to have it both ways. Essentially, in my opinion, the Blacks want to be segregated in that they want to behave however they wish to behave, irrespective of whether or not it fits in with the normative values and mores of American society yet, at the same time, they never want those behaviors to in any way negatively impact their personal or communal outcomes, hence integration. Thus, I can speak so. It is, after all, by the “Black Community’s” own tacit admission a matter of culture and ideology, not genetics. It’s a simple American truth, you are or become a part of us or you don’t. We don’t easily accept any middle ground when it comes to assimilation. This is a truth that the “Black Community” both fears and hates. Hence, they will attack any Black, such as Stacy Dash, that openly accepts this truth and speaks it aloud. Indeed, they have an entire well-established lexicon of epithets for such apostates. 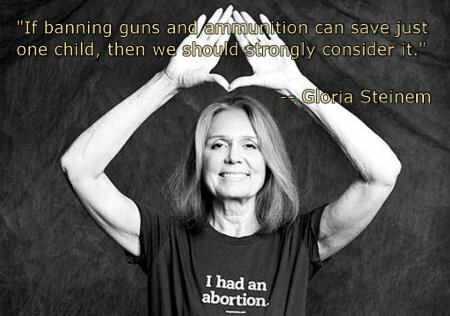 Still, Gloria Steinem – beloved among Feminists and reviled by Americans – claiming we have to forbid Americans from owning firearms because it might save one child is a new nadir. A defiantly proud baby-killer such as Steinem claiming the love and protection of children as an rationale for anything would be so.